comic books, however, was as little commented-on at the time as it would be today. That's probably because it ran unobtrusively in the rear of another hero's comic. But it was a very well circulated comic, and the feature ran there for a long time. It was in the 39th issue (December, 1952) that Russ Manning, then a newcomer to the field, took over the art. His graceful, open linework made him a favorite among readers and editors alike, and his work appeared in dozens of Dell comics during the next several years — not just in TV and movie adaptations such as 77 Sunset Strip and Disney's Pollyana, but also (after most Dell titles were transferred to Gold Key Comics) his own Magnus, Robot Fighter. 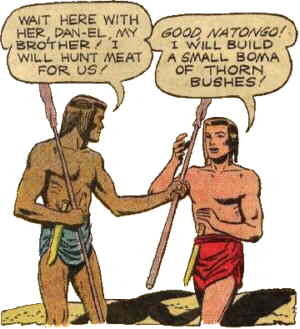 Manning stayed with "Brothers of the Spear" for the rest of its continuous run in the back pages of Tarzan, which lasted until 1966. The apparent reason for its end was Jesse Marsh's retirement, when Manning took over the art on the rest of the Tarzan title (which, by that time, Gold Key was publishing). A new back-up feature, Dan Spiegle's "Bantu, Dog of the Arande", took its place as of #157 (April, 1966). Dan-El and Natongo were back a few months later for another pair of very short adventures, and several years after that, in a brief series of reprints. A final original story appeared in #202 (August, 1971), written by DuBois (who had scripted the series all those years) and drawn by Manning's assistant, Mike Royer. Another Manning Assistant, Bill Stout, tried to develop it as a newspaper comic strip, but that effort was unsuccessful. The Tarzan title was taken over by DC Comics in 1972, but "Brothers of the Spear", which was not a property of the Edgar Rice Burroughs estate, didn't go with it. Instead, Gold Key brought them out in their own title, with artwork by Jesse Santos (Dagar the Invincible, Tragg & the Sky Gods). Brothers of the Spear continued to headline its own comic until #17 (February, 1976), then one final issue came out in 1982. When, in the late 1980s, Valiant Comics acquired Doctor Solar, Turok and other properties of Western Publishing (which owned or licensed most of those published by Dell and all of those published by Gold Key), "Brothers of the Spear" didn't appear to be part of the deal. It's gone now, but its high adventure isn't likely to be forgotten, despite the fact that it never was a very prominent series during its decades in print. And as an early harbinger of a modern approach to race relations, it has a secure place in comic book history. Text ©2003-08 Donald D. Markstein. Art © Western Printing.